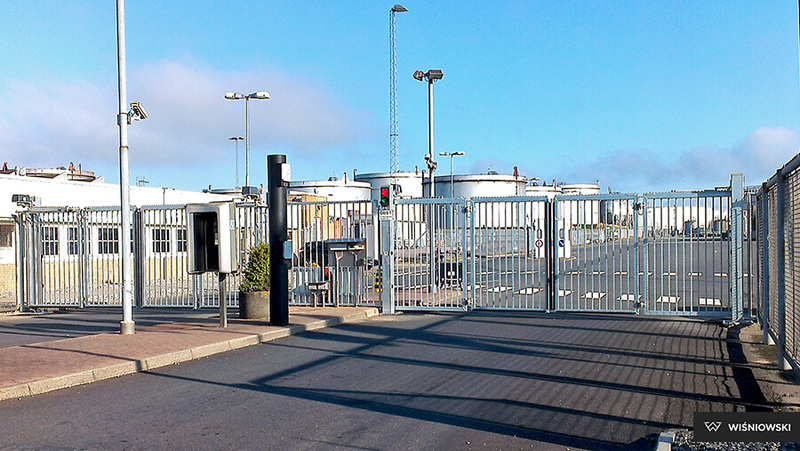 Application: V-KING gate is a perfect solution for logistics centres, sea ports, airports and other industrial areas. 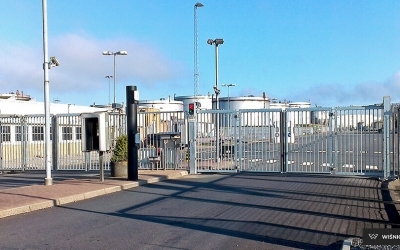 The gate combines advantages of double-leaf gate and barrier, providing access control or traffic flow management. Opening/closing speed up to 1 m/s. 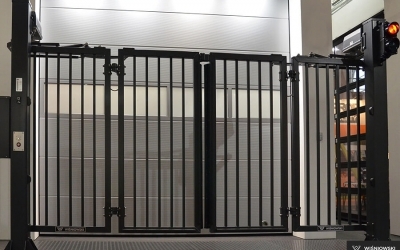 The gate is dedicated for continuous operation, and equipped with durable DAAB automation and advanced EP 104 control unit. The gate is safe. It is available in single and double-leaf versions. Corrosion protected by hop-dip galvanising or Duplex system: hot-dip galvanising + polyester coating. 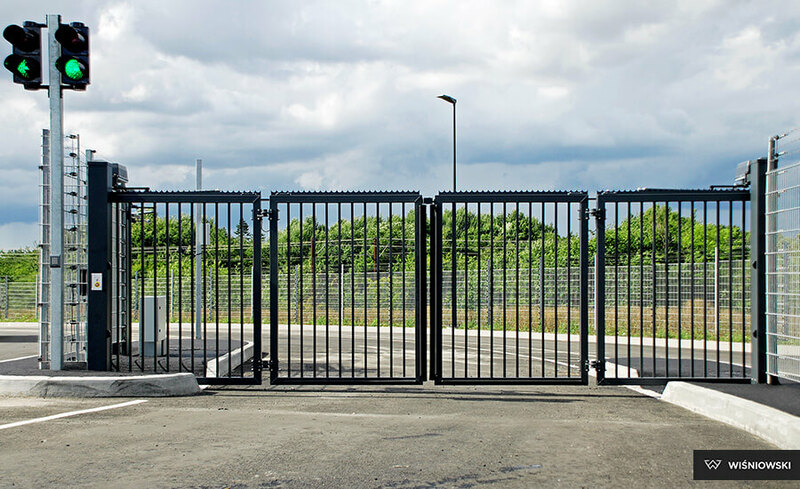 The gate as standard features 10 safety edges, two sets of photocells and two emergency safety switches. Compliance with EU Directives. Standard PN EN 13241-1 + A1:2012. The gate is hung on posts by means of hinges and link arms. The gate requires no additional ground or overhead track. Equipped with the fastest available DAAB automation which enables the speed of up to 1 m/s. 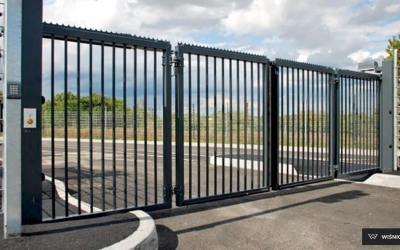 The materials and solutions applied allow for the continuous operation of the gate. Drive for intensive operation. WIŚNIOWSKI fences are system solutions. We offer modern steel fences, section-infill fences and welded wire mesh fences for the home and for industry. Our fences provide durability and high quality combined with elegance and style. WIŚNIOWSKI complex solutions give you a peace of mind especially when you need to enclose your property and ensure it is safe and visually appealing. 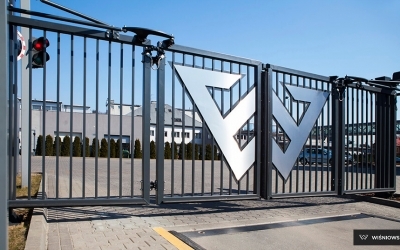 WIŚNIOWSKI fences are good choice both for private properties and industrial areas. Take advantage of the whole offer and create your unique fencing. Combining hot-dip galvanising with powder coating in DUPLEX system ensures the extended durability of WIŚNIOWSKI fencing. Despite the weather conditions, we have a lasting peace of mind that WIŚNIOWSKI fencing will be visually appealing. Frame welded from 60x60 mm hollow sections in single-leaf gates up to 2950 mm wide and in double-leaf gates up to 5950 mm wide. 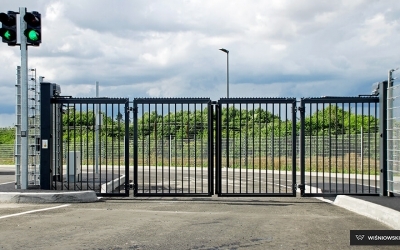 Frame welded from 80x80 mm hollow sections in single-leaf gates from 3000 mm wide and double-leaf gates from 6000 mm wide. The leaves are folded and connected by units set on rolling bearings. Link rods and rod joints are made of stainless steel. The leaves feature stainless steel LOCINOX guiding cables. Receiver and roller are installed in the middle of the gate. The gate is available as double-leaf or single-leaf (left or right handed) version. 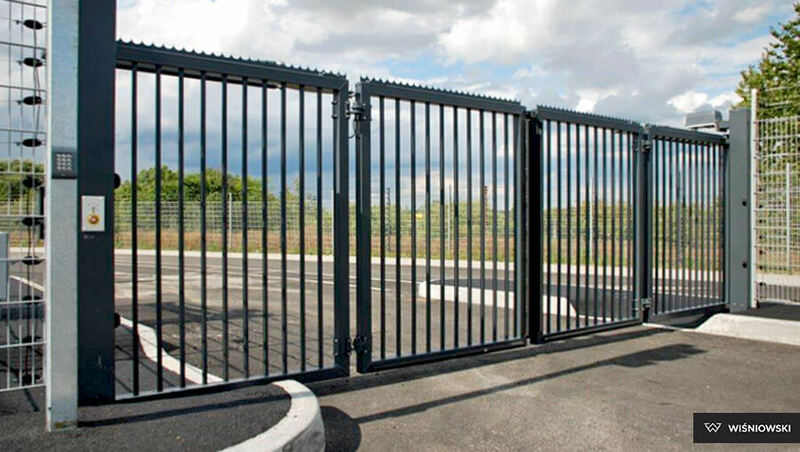 For single-leaf gates up to 2950 mm wide and double-leaf gates up to 5950 mm wide, the post is made of 160x160 mm section, while for single-leaf gates from 3000 mm wide and double-leaf gates from 6000 mm wide, the post is made of 200x200 mm section. 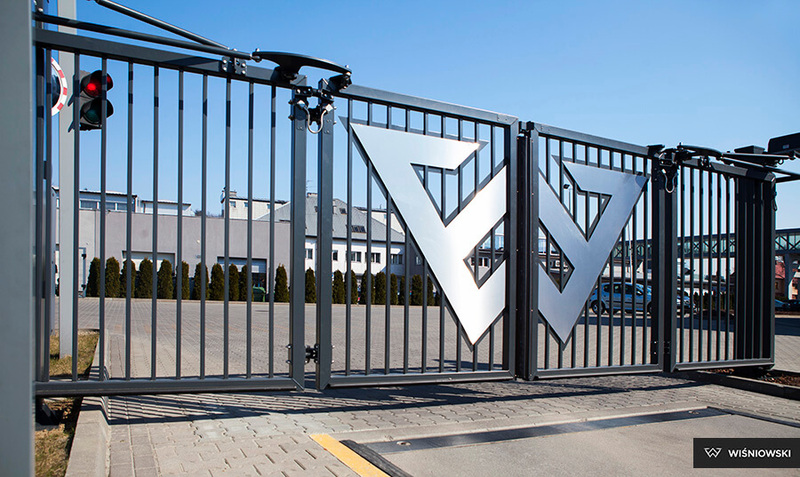 V-KING gates are equipped with special-purpose automation manufactured by DAAB company. Operating speed is up to 1 m/s. Designation: intensive operation. In double-leaf gates of up to 7000 mm in width (Sj) and single-leaf gates of up to 3500 mm in width (Sj), MT type drive unit is applied. 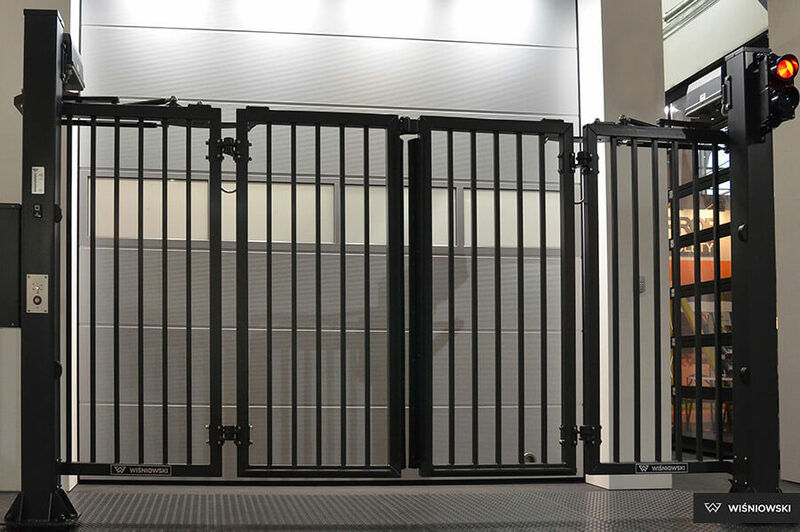 In double-leaf gates of above 7000 mm in width (Sj) and single-leaf gates of above 3500 mm in width (Sj), MK type drive unit is applied. The drives are installed on the main posts. Torque is transmitted to the leaves by a system of arms. The control unit is DAAB’s EP 104-1 or EP 104-2 installed in the cabinet rated IP 65. The control unit can be equipped with extra options to provide a wide selection of active and passive user’s safety. As an option, drives are available in stainless steel casing - type MT1H or MK1H.